One thing, of many, I like about my Brazilian Jiu Jitsu class format is the consistency. Our 2 hour class begins with a light warm up of running around the mat in different ways; forwards, backwards, sideways, knees up, kicking behind, and sometimes jumping and sprints. After we finish running we do some technical drilling like break falls, rolls, shrimps, sprawls, firemen carry, etc. And then stretching top down. All in all this first part of class lasts about 20 minutes to a half hour. And it is easy enough as to not cause exhaustion and gross motor skills for the learning and rolling part of the class. The learning part of the class is when Professor Schilling, my instructor, shares his techniques and we break out and work with a partner. The teaching style of this is great. The introduced technique is usually broken into sections. You get the first part down and then move on. Then the second. And then the third. This breaking down of the techniques helps get a fundamental understanding of the “what comes first” mechanics before moving on. It is a great way to learn and retain information. After the warm up, stretching, and skills development, we start the rolling part of the class. Professor pairs up the class for a series of 5, 6 and 7 minute rolls (a roll is a controlled ground fight). Generally senior belts work with junior belts in the beginning and then moves to similar skilled student rolls. When I first began, I did not even roll for the first two or three classes; Professor allows all new students to watch first to get an idea of what is going and avoid injury. I have attended hundreds of Karate classes to attain my Shodan (First Degree Black Belt). There is far more formality in Karate, but the curriculum is spread out and you never knew what came next; weapons, kata, basics, self defense, drills, etc. I prefer the Brazilian Jiu Jitsu format as it allows me to more easily focus on my development in the art and takes into account how the body was designed to operate; warm up, introduce new function, apply skills in a stressful environment, then rest and recover. Training in a Brazilian Jiu Jitsu class 2 or 3 times a week helps condition the body properly without injury and even leaves extra days to spend some time in the gym on cardiovascular or anaerobic workouts. Progression is guaranteed if you make it to your classes consistently. 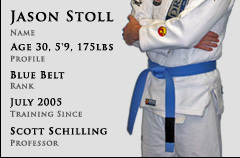 If you want to know more about Schilling Jiu Jitsu, my awesome Brazilian Jiu Jitsu School, visit scott-schilling.com.